Corporate Scope: Material Innovations, Inc. (MII) is a small business comprised of composite specialists with an extensive background in advanced composite materials design and engineering. The company was historically (and still is) focused on research and development of materials to meet flight system requirements Examples are in electronic packaging, spacecraft, and aircraft applications. Material Innovations, Inc. strives to provide high quality engineering, material development, and testing services to the U.S. government and commercial industry on a cost-effective schedule. A primary MII goal since inception has been to qualify high-performance materials for existing and new applications in industry. This is accomplished through the utilization of technology transfer and the development of prototype components. MII has in the last 10 years increased its scope to develop non-composite products (i.e. machine gear and other hardware) which leverages from the extensive background acquired over the years. Corporate History: The employees of Research Opportunities Inc (ROI) formed MII in 1997. MII was essentially a corporate name change to ROI in order for allowing employees to participate in ownership of the company. MII purchased the laboratory, fabrication, machining, and administrative facilities from ROI that was utilized for development of advanced composite materials. All of the personnel who had been performing this work at ROI were transferred to MII. The President and CEO is James C. Calder, former Vice President of ROI. MII’s history in composite design and evaluation dates back to ROI’s inception in 1982, under the direction of William C. Riley, President and CEO (Mr. Riley is now a consultant for MII). During that time, ROI became nationally known for unique thermal-mechanical measurements as well as unique component designs utilizing advanced techniques developed by Mr. Calder. Customers include the major aircraft and spacecraft system primes, as well as many composite manufacturers. 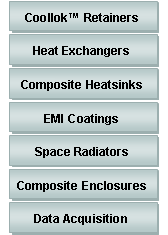 For example, Loral Space Systems designated ROI/MII as its source for thermal evaluation of high modulus composites, leading to acceptance or rejection from the composite manufacturer. In addition to the direct interaction with measurement customers, ROI/MII had conducted more than 25 government contracts or subcontracts directed at engineering evaluation and component design of advanced composites. Since that time, MII has continued this trend with an additional 35 related contracts that carry this technology forward to date. This work has led to the development of a very extensive database on advanced composites, containing over 8000 entries on mechanical and thermal properties, as well as descriptions of fabrication techniques. Thus, MII is able to provide customers with a perspective on their current composite materials selection that includes a comparison with other available legacy composite materials that are common place today.